The annual entry draft is one of the biggest days in the NLL off-season. Obviously each team is trying to improve by drafting players who they hope will contribute to their team for many years, but the fact that all the GMs get together in one place increases the possibility of trades and makes the day that much more interesting. Drafted players in the NLL can make an immediate and significant contribution to the team that drafts them, much more so than in hockey where drafted players frequently need another year or two of seasoning before they’re ready for the NHL, and especially in baseball where a drafted player may not make the majors for five years or more, if ever. In lacrosse, it’s not unusual for a drafted player to be familiar with many of his teammates and opponents thanks to playing in the summer leagues. I imagine this helps the NLL GMs significantly, since they don’t have to wonder how the player will do against NLL-calibre opponents – they can see first-hand. Every year, someone is given the honour and/or the curse of being drafted first overall. In this article, I list the last ten first-overall draft picks and with the advantage of hindsight, who the first overall pick should have been. Keep in mind that if the “hindsight pick” isn’t the same as the guy actually chosen first, that doesn’t necessarily mean that the GM screwed up and should have taken someone else. Players don’t always work out as well as was expected. Sometimes the player just didn’t make the transition to the NLL as smoothly as others, sometimes there were work commitments that meant the player had to miss significant time, sometimes there were injuries, and sometimes another player who wasn’t chosen first ended up exceeding the expectations of him. It’s been said before that 2011 was the strongest draft in years, possibly ever, but here’s something that really drives the point home. 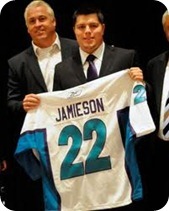 Everyone drafted in the top two rounds of the 2011 draft saw playing time in the NLL in 2012. You have to go to the fourth pick of the third round – number 22 overall – before you get to a drafted player who did not play in 2012, that being Washington’s Adam McGourty. Obviously with only a year behind them, it’s hard to say who’s the best of this amazing bunch. Adam Jones won Rookie of the Year, but Crowley, Jordan MacIntosh, or Evan Kirk easily could have. Kyle Rubisch is widely regarded as the best defender in the league, having been chosen as such in 2012 by both the league and IL Indoor. But Cody Jamieson is a legitimate offensive star, and given that he led the Knighthawks to the Champions Cup (and was named Championship Game MVP) in only his second season, you can’t say that the Knighthawks made a mistake drafting him. 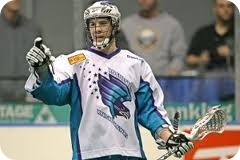 Sid Smith is a big, solid defender and like Jamieson, was instrumental in helping the Knighthawks to the 2012 Championship so again it’s kind of hard to say the Knighthawks made a big mistake here. But as good as Smith is, it’s tough to argue with Leblanc, the 2010 Rookie of the Year, and Billings, the current single-season assists holder and 2012 MVP runner-up, as being better choices. Veltman had an excellent rookie season, scoring 77 points for the Blazers in 2009, and followed it up with 65 points in his sophomore season. 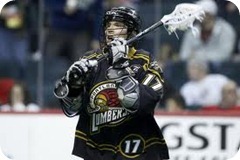 He was then traded to the Roughnecks in the Josh Sanderson deal, but his 2011 season was not was the Roughnecks expected. Having picked up 43 and 42 assists in his first two seasons, the Roughnecks (and Veltman himself) were a little disappointed with the 42 points Veltman tallied in 2011. He rebounded a little in 2012 with another 42 assists and 62 points, so Veltman isn’t a bust by any definition. But IL Indoor named Rhys Duch the #1 player in the league at the beginning of the 2012 season, and the only reason he was below 85 points this past season (his first such season) was because he missed a couple of games. He ended up with a paltry 79 points in 14 games, which extrapolates to 90 over 16. Hall has been one of the game’s better transition players since his debut with the New York Titans in 2008, and was given the NLL Sportsmanship Award in 2011. He’s played more of a defensive role in Rochester than he did in New York or Orlando, but was still an important part of the Knighthawks 2012 Championship season – or at least the first 2/3 of that season, before he tore a knee ligament and missed the last 6 games and the playoffs. Was he the best player in that draft year? Probably, though an argument could be made for Calgary’s Dane Dobbie, who only scored 7 points in his 5 games in 2008, but exploded for 75+ points in each of the next three years. He only scored 50 last season, but missed three games due to injury. This year had a great draft class – you could argue for Geoff Snider (4th) over Benesch, and this group also included Kyle Sorensen (2nd), Ian Llord (5th), Paul Dawson (7th), Athan Iannucci (8th) and Brendan Mundorf (11th). 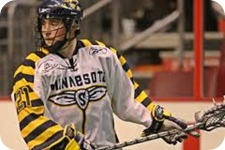 Benesch was drafted by the Stealth but was immediately traded to the Rock in the deal that sent Colin Doyle out west. Benny had a great rookie year (58 points and a Rookie of the Year award) but then dropped off a little in his second season, which concluded with his being inexplicably benched for the last two games of the year. After being benched again for the first two games of the 2009 season, Benesch was traded to the Edmonton Rush along with Derek Suddons for draft picks* in one of the most stupidly lopsided trades in Rock history. Benny’s numbers dropped a little more in 2009 before he was traded to the Swarm where he flourished, turning into one of the most potent scorers in the league and winning the scoring title in 2011. * – One interesting footnote here: The Rock sent Colin Doyle to the Stealth for Ryan Benesch. (There were others involve in the trade, but it was essentially Doyle for Benesch.) When Benesch was traded to Edmonton two years later, one of the draft picks sent from the Rush to the Rock was a first-rounder in 2009. With that pick, the Rock selected Joel Dalgarno, who was later traded to the Stealth along with Tyler Codron and Lewis Ratcliff for – guess who? – Colin Doyle. Another good group including Shawn Evans (2nd), Luke Wiles (4th), Matt Vinc (6th), and Jeff Zywicki (8th), but Merrill’s been Rookie of the Year, Defender of the Year, and Transition Player of the Year twice. He makes any team he’s on better, and has been considered one of the best players in the league since his first season. Powless entered the league with a lot of hype, mainly because he was the first overall pick. But part of the hype was the fact that he is part of the legendary Powless family. He played well, no question, racking up 40+ points in his first four seasons including 55 in 2008. But he never really lived up to what you might expect from the first overall pick, and after a substandard 2009 and only a single game in 2010, Powless was released by the Bandits and hasn’t played in the NLL since. 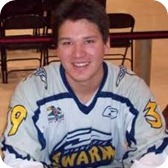 Miyashita was a defenseman and faceoff guy who played a single season with the Ravens, one season with the Mammoth, and then parts of three seasons with the Swarm before calling it quits due to multiple injuries. Ward, Evans, and Ranger are still legitimate scoring threats and have luckily avoided the injury bug. I like Patrick Merrill. I think he’s a hard worker, a good defender, and a pretty good fighter as well. But Mark Steenhuis is one of the best transition players of the last ten years. At one point I remember saying that there was nobody on the Rock that I wouldn’t trade for Steenhuis. Of course, this was when Doyle was in San Jose and the team was 6-10 while Steenhuis was lighting up the league, so that’s no longer true. But Steenhuis over Merrill is really a no-brainer. I won’t go through all of the previous years, but a few names stand out as obvious hindsight picks. In 1996, Tim Langton was chosen first overall, while Cory Bomberry was taken third. 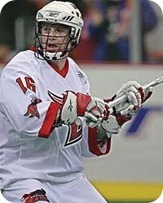 Langton played three seasons with the New York Saints, while Bomberry played fourteen seasons with Rochester, Arizona, and Buffalo, winning a Championship with the Bandits in 2008. In 1993, John Webster was the first overall pick, taken by the Philadelphia Wings. Webster never played a game in the NLL while the New York Saints’ fourth overall pick, Mark Millon, played 96 games over ten years, ironically finishing his career with the Wings. Jim Buczek was the Pittsburgh Bulls’ first overall choice in 1992. Buczek’s pro career was limited to three games, while the Bandits had the sixth overall pick and drafted some guy named Tom Marechek. Obviously he never made much of an impression on the Bandits, since he was traded to Philadelphia before he ever played a game for Buffalo. He did OK in Philly though, where he won four championships over twelve seasons and is now in the NLL Hall of Fame. Will the NHL lockout affect the NLL? When it became clear that an NHL lockout in 2012-2013 was inevitable, many NLL fans, writers, players, and executives seemed to believe that while this is a big drag for hockey fans (which many lacrosse fans are), it could be a good thing for the NLL. The obvious logic is that without hockey to watch, hockey fans may look for other places to spend their sports event dollars. What better place to spend it than on a league that plays in many of the same arenas, with a similar sport, featuring some of the best athletes in the world, and with tickets that cost a fraction of NHL tickets? The NLL can’t lose! Can it? Of course, this has happened before. The NHL missed the entire 2004-2005 season due to a lockout, and so the entire 2005 NLL season was played while there were no NHL games being played. How did the NLL do attendance-wise that year? Let’s have a look. The overall average attendance for the NLL in 2005 was 10237, which was up 3.6% from 9885 in 2004. Looks promising so far. But 2004’s attendance was up 14.3% from 8649 in 2003, so attendance was already increasing. In 2006 the attendance was 10703, which was up 4.6% over 2005. 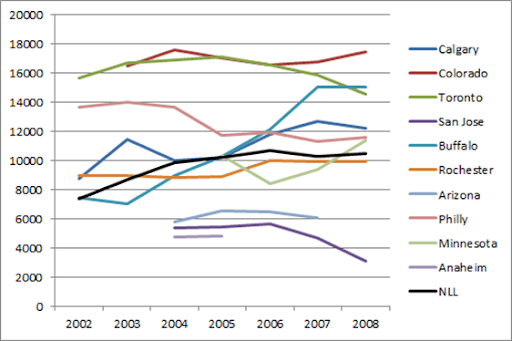 Overall attendance did increase in 2005, but less than it had in 2004, and less than it would in 2006. Here is a graph showing the average home attendance for each team as well as for the entire league (the black line in the middle). Do you see any peaks in 2005? Toronto has a little one, but they won the Championship with a powerhouse team. 2005 was the last year of the Rock’s early-2000’s dynasty so the increase makes sense. Buffalo was right in the middle of their impressive resurrection from only 7002 in 2003 to the mid-15000’s only 4 years later. Arizona was up 13.9%, but that’s all of 800 people. Other teams showed no significant increase, if any. Calgary was up 2.1%, but grew 15.4% the next year. Anaheim, San Jose and Toronto were up less than 2%, and Rochester less than 1%. Colorado was down 3% and Philly was down almost 14%. The obvious but unfortunate conclusion is that the 2004-2005 NHL lockout had little to no impact on NLL attendance. Unfortunately, I don’t have any TV numbers, so I can’t look at whether more people watched the NLL on TV in 2005. 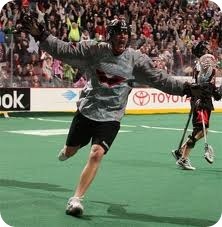 If the NLL approached TSN or Sportsnet or the CBC (Anyone for “Lacrosse Night in Canada”? Could it happen?) with the opportunity to televise NLL games, that could be a ton of exposure for the league. I don’t pretend to have the faintest idea on how the finances of such a deal would work; it could be that the NLL would have to pay for that privilege rather than receive money from the networks. I know the Rock paid to have some of their games televised over the last couple of seasons. Could the NLL benefit from the NHL lockout? Attendance-wise, it doesn’t seem likely without the league doing a fair bit of work (and possibly spending a fair bit of money) to advertise the hell out of the league and bring new people in. After that, it’s up to the league to continue that push to make sure all those first-timer’s come back once hockey starts again. My family and I recently travelled to St. Catharine’s, Ontario, for a day of exploring the Welland Canal. This is about a 45-minute drive from where I’ve lived for the past fifteen years, but I had never been there. 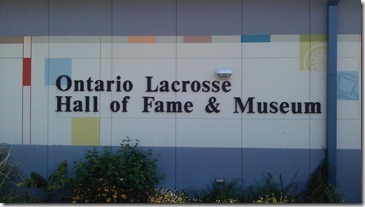 It wasn’t until we arrived at the Lock 3 visitor’s centre that I realized that the same building also houses the Ontario Lacrosse Hall of Fame and Museum. In addition to watching 35,000-ton ships over 700 feet long navigate into a passage only two feet wider than themselves, we got to see some pretty cool lacrosse memorabilia and recognize some of the pioneers of lacrosse in Ontario. The HoF is part of the St. Catharine’s Museum and is not a big place, but there are a lot of jerseys, sticks, old photographs, and even paintings and sculptures. There is a listing of players who have been inducted into the Ontario Hall, as well as Ontario-based players and builders who have been inducted into the Canadian Lacrosse Hall of Fame, which is located in New Westminster, BC. There were a number of pictures of former Mann Cup winning teams from Ontario. There was one from the 1980 Brampton Excelsiors featuring a very young-looking Terry Sanderson. I found one from the 1993 Excelsiors that contained a whole bunch of familiar names: J. Sanderson (turned out to be John, not Josh), T. Cordingley (Ted), D. Teat, J. Grant (Sr.), P. Coyle, K. Dance, another T. Cordingley (that one’s Troy), J. Tavares, B. Shanahan (Brian), S. Dietrich, and P. St. John. Even the list of people who were absent from the picture is impressive: Jim Veltman, Tom Phair, Randy Mearns, Rich Kilgour, Darris Kilgour, Derek Graham. Recognize this kid? Yup, that’s none other than NLL Hall of Famer Steve “Chugger” Dietrich. How about these guys, holding some hardware? 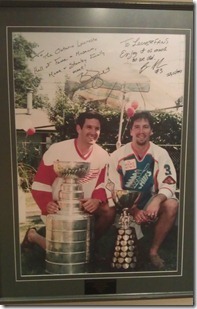 The caption reads “Mann’s Best Friends”, and of course this is Troy Cordingley and the ageless John Tavares. They’re both wearing Six Nations Chiefs jerseys (which would put the picture at 1995 or 1996 when they were both won the Mann with the Chiefs), but you can see “Bandits” on Cordingley’s stick. There were lots of NLL All-Star jerseys hanging up, with lots more names familiar to NLL fans: Doyle, Point, Carey, Tavares. There were also pictures of the so-called “builders” of the game, which generally means GMs and coaches and such. 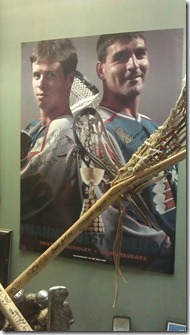 But there were a number of exhibits on the real creators of lacrosse: the First Nations people. They showed how wooden sticks were made, and talked about how they have been playing lacrosse for hundreds of years, how they used it to settle disputes between tribes, how they played on fields that were miles long and had no “out of bounds”, and how they had no limit on the number of players on each team (as long as the numbers were “relatively close”). The thing that really amazed me was that in many cases, the only rule was that you were not allowed to touch the ball with your hands. The only rule. And you thought the game was rough now. My whole family had a great time visiting the Ontario Lacrosse Hall of Fame, as well as the St. Catharine’s Museum and Lock 3 on the Welland Canal. I was going to make a joke about “maybe someday when they have a Bloggers category, I might return as an inductee” but in all seriousness, even making such a joke makes me feel disrespectful to those players, builders, and pioneers of the game who have legitimately been inducted and celebrated. All of the inductees have my appreciation, my congratulations, and my respect.